1) Walking to the right you would come to the forest from where a yellow trail leads up to the castle. However, I strongly advise you against that choice of road since the approach is very abrupt, and the mountain – high. The route is exclusively for rock climbing lovers. 2) Walking to the left you would come to the buildings, where beyond the pond you ought to go right down the path uphill. There is situated another pond, past which you have to turn right again and go upwards down the yellow trail to the ruins. Regardless of the choice of route, the trail is very neglected and overgrown with dense shrubs. It is probably a norm all over the Lower Silesia: all yellow trails, down which I have been hiking, were bushy. 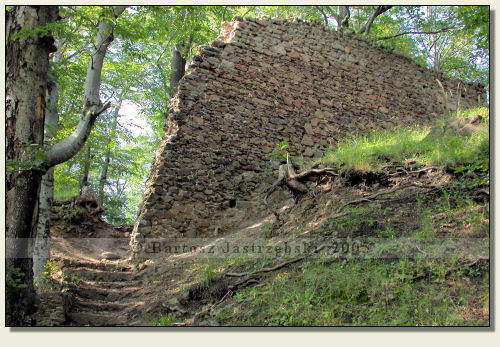 Emergence of the Castle in Nowy Dwór was not completely researched. 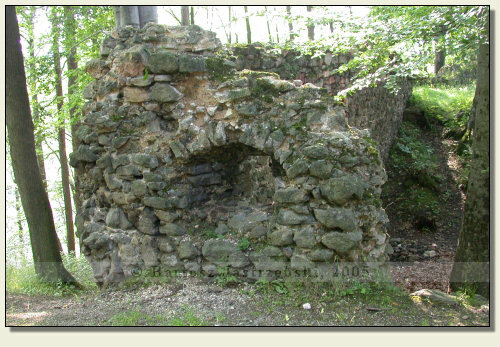 It was probably built at the beginning of the XIVth cent by dukes of Świdnica-Jawor, whereas in historical sources it appeared for the first time in 1364. 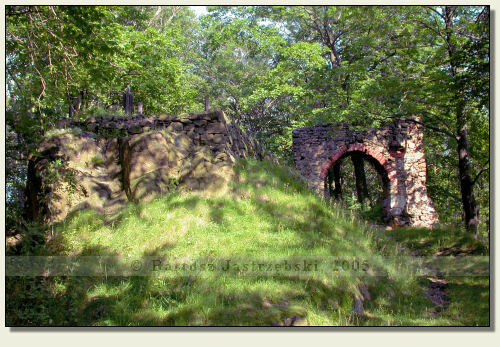 It was the then Agnieszka’s property, a widow of Bolko II. It quickly changed its hands however and since then it became the norm for many years. 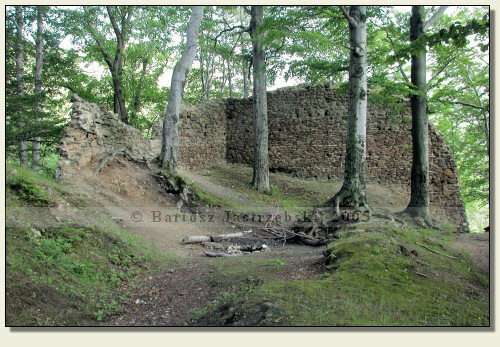 At the end the stronghold came into property of Czetryc family, who resided there till the end of the XVIth cent. 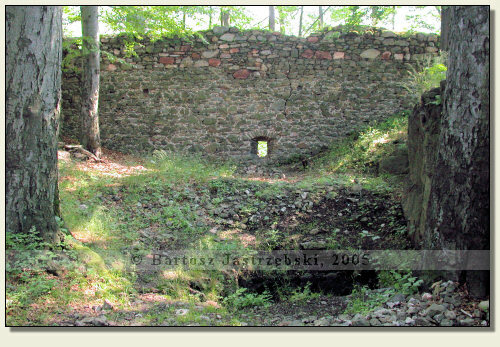 Regardless of its situation the castle was ineffectively besieged during armed conflicts (e.g. Hussite Wars) and played vital roles in them. 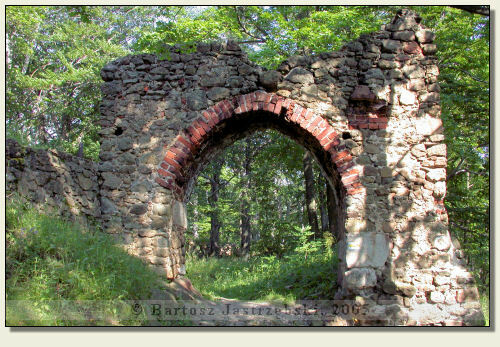 In 1581 the castle burnt down and has never been reconstructed again, while Czetryc family moved to a palace, built in 1604 at the foot of Zamkowa Mountain. Defensive values of the castle, however, were used once again in time of the Thirty Years’ War.